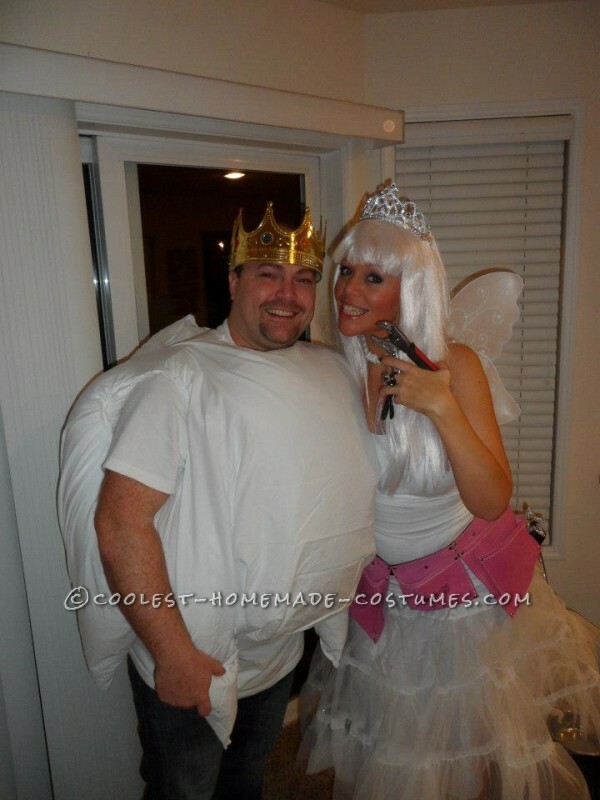 I decided 24 hours before a party that I wanted us to go as a tooth and tooth ferry. Cut up the bottoms of the long pillows and shape the corners to form the roots, then sew edges. Cut armholes towards the top of the pillow (you may want to step into the cube to get correct placement), then sew edges. Cut a hole in the middle of the white sheet (that your head will fit through). Put the tooth on. Put your head through the hole in the white sheet and let the rest of the sheet fall over the tooth. Adjust for comfort and look. Have a friend pin the sheet into place all around the tooth. You will have to cut excess sheet away and tuck it under the edges and pin to get a finished look. Carefully take it off and sew the sheet in place very securely, then remove pins. I bought a crown for him to wear….get it his tooth had a crown on it. Mine Tooth Ferry costume was much easier. 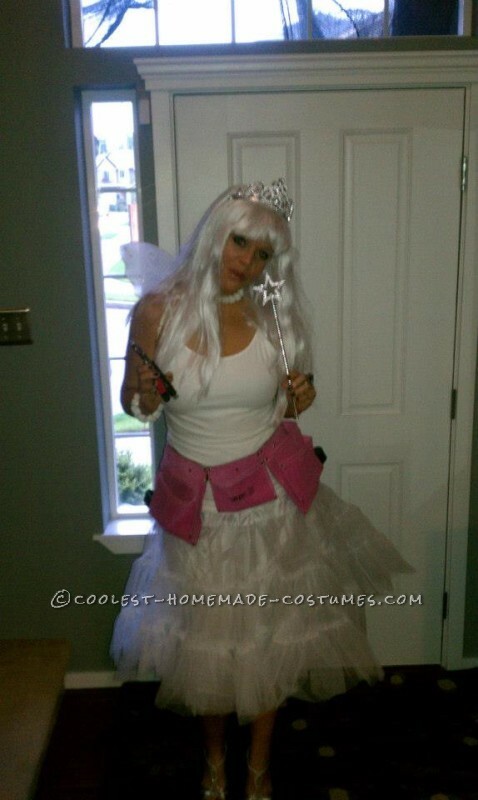 White tutu, white tank top, I bought kids size wings and wand because we were going to be at a party I didn’t want my wings in the way. I had the long white wig and bought the pink tool beld and filled it with tooth tools like plyers. Finally I found plastic teeth and strung them together to make a tooth necklace. People loved the costume and we won best costume of the night!